A viable alternative to Finale and Sibelius. Check out the free alternatives, though - they may be all you need. Flexible input methods. More than adequate printed results. Nicely sampled instruments. Well laid out manual. Reasonably priced. Tries to be too many things. Not as graphically flexible as we'd like. Notion 4 comes as a 7GB download (£83) or on a dual layer DVD (£119), requiring 8GB of drive space to install. It then needs to be authorised, either directly online or by email if your installation computer is not internet connected. We found the latter process went very smoothly with good support from Notion. "Notes can be entered from a MIDI keyboard, via mouse and QWERTY keyboard, or with the on-screen keyboard and fretboard"
The demo scores in a variety of styles look impressive, although most of the individual instrumental parts aren't properly formatted, creating a sloppy impression and missing the opportunity of showing just what the software can do. Notes can be entered in real-time from a MIDI keyboard, in step time via mouse and QWERTY keyboard, or with the on-screen keyboard and fretboard, and they can easily be corrected and modified once entered. Oddly, the software immediately responded to a rather older MIDI keyboard that we hooked up to it, but it wouldn't detect input from a newer USB keyboard that other programs had immediately adapted to. A full range of everyday (and some less frequently used) markings such as key and time signatures, staccato, accents, slurs and dynamics can be applied from an intuitive popup menu within the Edit screen, while instruments can be added and deleted and their position in the score order readily adjusted in the Score Setup. In addition, scores can be imported from other applications via XML and MIDI files, though with the latter, the parts appear on special piano-roll style 'Sequencer Staffs' and need to be copied across to regular music notation staves to make a score. To play back your scores, Notion can use its own in-built sounds, which, as you might expect, sound like a high-quality General MIDI soundset. Fortunately, you can supplement this with VST instruments, and Notion 4 is also ReWire- enabled, so the potential sonic palette for turning your scores into sound is limitless. "Notion has come on a long way since its early days and is maturing into a fully featured application"
Playback can be from the score, following dynamic markings and any metronome markings you might have added, and Notion 4 can also be 'performed' in real time via your MIDI or QWERTY keyboard, playing back a step at a time, at a tempo determined by the speed of your key presses - sort of like a weird combination of step sequencer and tap tempo function. You can even record your subtle variations in performance. In addition, precise MIDI lengths and velocities can be tweaked just as they would be in a regular DAW, without affecting notation. We're just a little puzzled by this, to be honest, clever though the implementation is. We think of Notion, like other score-writing applications, as primarily aimed at highly musically literate composers and arrangers who need to produce professional quality scores and parts, but are we now expected to take the software out and gig with it? It's possible to imagine scenarios where this might be a good idea, but they're rather unlikely ones. Focusing back on Notion's essential task of producing printed music, it does the job pretty well with a minimum of fuss. Notion has come on a long way since its early days and is maturing into a fully featured application. 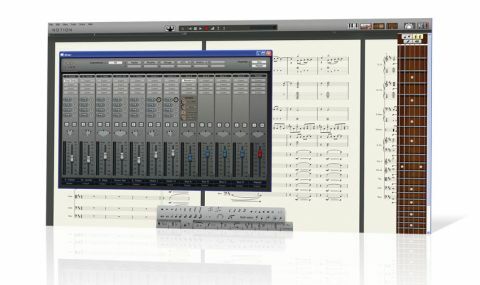 We're not sure how much use will be made of its flexible playback capabilities, but they're good nonetheless, and it's up to the more essential task of creating scores and parts efficiently.